Early Sports and Pop Culture History Blog: The Return of the Prodigal Song Title - a History and Etymology of "If I Knew You Were Coming, I'd Have Baked a Cake!" The Return of the Prodigal Song Title - a History and Etymology of "If I Knew You Were Coming, I'd Have Baked a Cake!" The idiom became popular in the 1950s, in the wake of a #1 hit record by that title, sung by Eileen Barton. Everyone, it seems, was singing the song in 1950. If Jesus Christ, himself, had told the parable of the prodigal son in 1950, he might have recorded the song to mark the occasion. Actual recordings were released by the likes of Bob Hope and Bing Crosby, Ethel Merman and Ray Bolger, Eve Young and the Homesteaders, Georgia Gibbs, and Gracie Fields. Years later, Bert tried to appease Cookie Monster by baking him a cake when no cookies were available. Larry Schaetzlein and George A. Hill wrote that song in 1923. Schaetzlein, later known as Larry Shay, became the music director for MGM studios in the early 1930s, where he hired Bing Crosby for his first film role at $50 a day. I guess turn-around is fair play. What’s not clear, however, is whether the expression existed as an idiom before it was a song title. Did the rival songs of 1923 reflect an idiom already in existence? – or did William J. Ryan coin a new expression? Did it exist as an idiom before 1950? – or did the popularity of the song, and pithier phrasing of the expression, lead to a revived song title becoming an idiom? My sense is that it was not used idiomatically before 1950. The only evidence I can find of the existence of anything like the idiom before 1950 are the two song titles from the 1920s. Other than those song titles, I have not been able to find any other examples, or hints, of the idiom before 1950. If you can find any such evidence – let me know; I might bake you a cake. Barry Popik, of The Big Apple Online Etymological Dictionary, has alerted me to examples of the expression in use before 1950, but after 1924. Some of those examples hint at the fact that expression may be even older; and two of the examples credit the popularity of the line to comic actor, Walter Catlett (although they differ in details as to when and in what show). 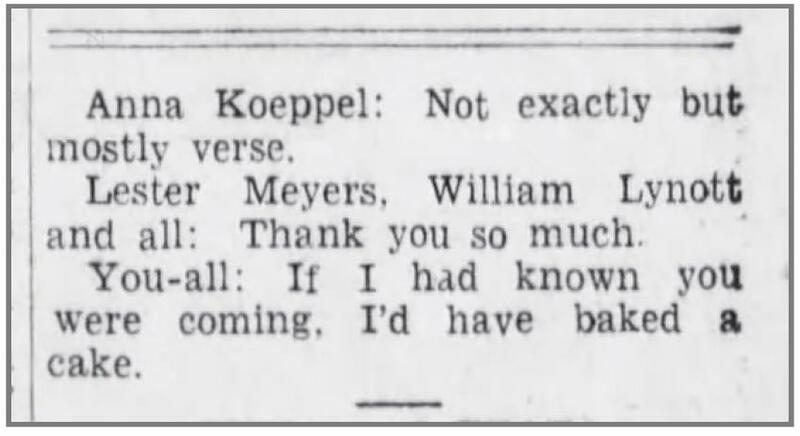 But whatever the details, and whether or not the expression pre-dates the songs, 1923 seems to have been a watershed year in the popularization of the expression. In August 1923, an article entitled “Cut Yourself a Slab of Pie and Leave the Cake Alone,” noted that, “[i]n those stirring days they never used to say: ‘If I knew you were coming I’d have baked a cake,” suggesting that the expression may have been newish. 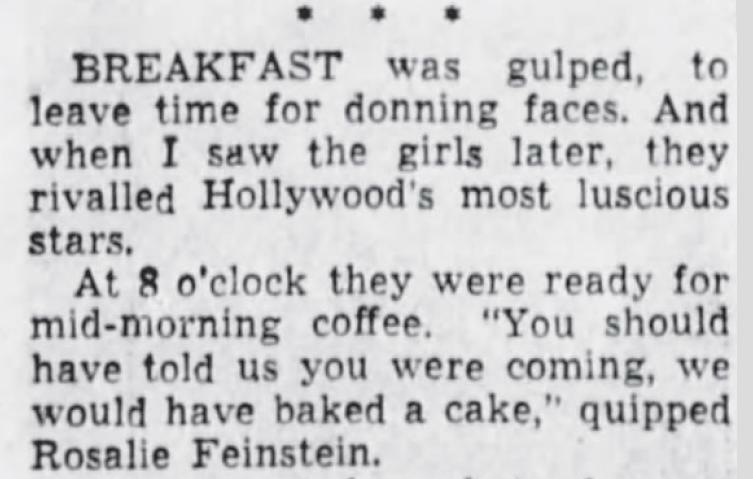 In April 1927, a Life Magazine theater review remarked that the new play, “Lucky,” was so devoid of entertainment, that, “even Walter Catlett, whose ‘If I’d known you were coming I’d have baked a cake!’ did so delight me in ‘Lady, Be Good,’ ha[d] no small chance to display his talents.” An advertisement for Hostess Cakes from 1929 asserted that, “The old-fashioned apology ‘Had I know you were coming, I’d have baked a cake,’ is obsolete in the modern home,” suggesting, perhaps, that the expression was older; although it could just be puffery, pointing out how “modern” pre-made Hostess cakes are (I prefer Ding-Dongs over Ho-Hos). Brooklyn Daily Eagle (New York), May 5, 1934, page 10.
. . . and Winnipeg in the 1940s. Winnipeg Tribune (Manitoba), June 8, 1944, page 13. 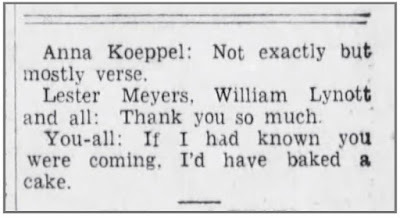 The Toledo Blade (Ohio), January 15, 1951, page 25. The two, unrelated attributions to Walter Catlett, separated by nearly twenty-five years, suggests that Walter Catlett may well have played some role in popularizing the expression; whether by singing the song, or voicing the line, on Broadway, Burlesque or Vaudeville. His role in popularizing the expression seems likely; given the two separate recollections separated by more than two decades. Walter Catlett did star in both of the plays that later reminiscences associated with the song (Lady Be Good and So Long Letty), but the precise time, place and mode of popularizing the expression is not certain. Lady Be Good, written by George and Ira Gershwin, premiered on Broadway on December 1, 1924; and starred Walter Catlett alongside Fred Astaire and his sister, Adele. 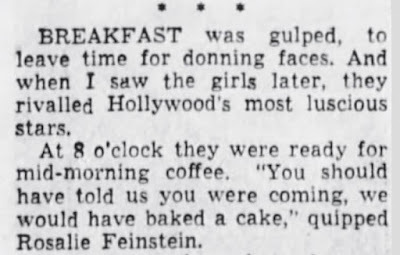 The show featured seventeen Gershwin songs; none of them “Baked a Cake” songs. The show opened long after the first “Baked a Cake” songs were written in mid-1923, so it is unlikely that the expression, or the songs, were first introduced in the play. 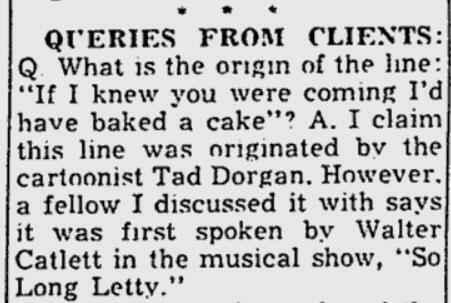 But that’s not to say that Catlett couldn’t have used the expression in the play, or added a non-Gershwin “Baked a Cake” song as a “specialty,” as was common at the time. So Long Letty opened in Los Angeles, California in July 1915 and reached New York City in late-1916, after long runs in San Francisco and Chicago, and several shorter stops along the way. The play was a musical adaptation of Elmer Harris’ comedy, Your Neighbor’s Wife, with words and music by Earl Carroll, who did not write any of the “Baked a Cake” songs from 1923 and 1924. 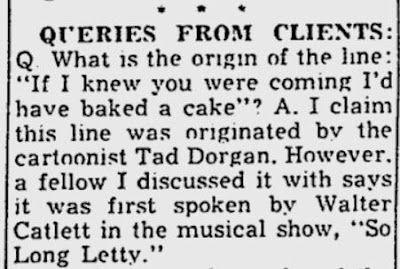 That’s not to say that he couldn’t have written a “Baked a Cake” song for the play, or that Walter Catlett didn’t say or sing “Baked a Cake” in the show; but there is no corroborating evidence that he did. So now we know that the expression was used idiomatically between 1923 and 1950; and we do not know whether the expression existed before 1923, or whether a songwriter, playwright or actor coined the expression sometime around 1923. But it seems likely that Walter Catlett may have had something to do with it. We'd bake a great big chocolate cake!